Chandmari Hill lies in Gangtok City in the Himalayan Mountain Ranges of Northeast India. The Himalayas are particularly prone to landslides due to complex geology combined with high tectonic activity, steep slopes, and heavy rainfall. Chandmari Hill has experienced a significant number of landslides, both rainfall and earthquake triggered, during the past several decades. Recently, the Government of India commissioned Amrita University to develop and deploy a landslide early warning system at Chandmari Hill. During the initial phase of the deployment, we conducted walkover surveys at Chandmari Locality, which comprises a large portion of Chandmari Hill. We also extracted and tested soil samples, drilled a 33.5 m borehole, and analyzed rock cores from the borehole. We present the results of laboratory soil tests and use these results in mathematical models. We examine all landslides (rainfall-triggered and earthquake-induced) recorded at Chandmari Locality during the past five decades. Simple calculations demonstrate that when the input parameters of the models mimic the field conditions precursory to an actual landslide, the factor of safety of the slope is less than unity. Gangtok City lies close to the Main Central Thrust, MCT2, which separates the gneissic rocks of the Paro/Lingtse Formation from the mica schists of the Daling Formation. Our field investigations revealed that at Chandmari Locality, gneissic rock overlies highly weathered mica schist. We postulate that surface runoff infiltrates through fractures in the overlying gneiss and results in an extrusion of the finer micaceous material, leading to subsidence which is routinely observed during the monsoon season. During torrential rains, rainwater infiltration causes the sliding of the soft micaceous bands underlying the gneissic rock, leading to rockslides at the hill. 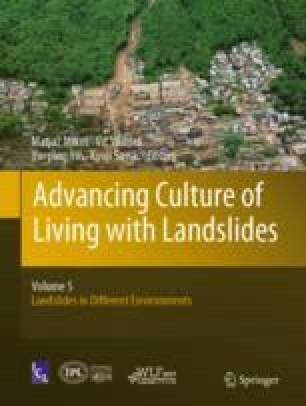 We suggest that similar processes are responsible for the frequent and widespread occurrences of landslides and subsidence observed throughout the region. We thank Mr. Ranjith N. Sasidharan for helping us prepare the figures for this paper, Dr. H. M. Iyer, Dr. R. Dhandapani, Dr. Sreevalsa Kolathayar, Dr. P. Thambidurai, Dr. Malay Mukul, Dr. Ganesh Khanal, and Mr. Keshar Kumar Luitel for technical discussions, Mr. Kevin Degnan for help with technical writing and painstakingly proofreading the entire manuscript, and Sri P. P. Shrivastav for his support of this work. We thank the session editor, Dr. Jan Klimeš, for reading our original submission with great care and providing insightful comments. The Amrita University landslide projects, aimed at developing wireless sensor network-based landslide early warning systems, are vast, multi-disciplinary efforts. The team is too large for us to name every member; we gratefully acknowledge their help and support. Above all, we express our heartfelt gratitude for the immense guidance and motivation provided by the Chancellor of our University, Sri Mata Amritanandamayi Devi (Amma). This work was funded by the Ministry of Earth Sciences (MoES), Government of India.